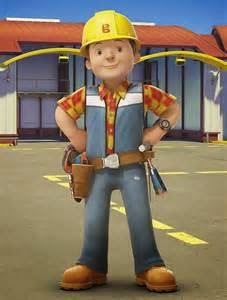 I read with dismay this morning that Bob the Builder is getting a reboot. 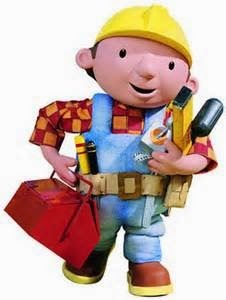 The new CGI Bob no longer lives in the quaint village of Fixham but has moved to Spring City, where he will use a computer to aid in his work. What is happening to the world, I ask you? It happened to Fireman Sam and Postman Pat. Even Angelina Ballerina did not escape the trend of children's TV characters moving to CGI forms and more 'relevant' lifestyles. They've taken them out of the villages and into the wider world of cities and computers and even mobile phones as they battle far greater elements and evils than Postman Pat's hole in the road. While I understand the motivation for this exodus, it also saddens me, because there is something frankly wonderful about a thirty-minute television program for children that focuses on nothing more than a thievish magpie or a leaky water pipe. I have a deep affection for Sam's mobile shop that provides oranges and bananas to the farms of Greendale, or the thatched roof cottages of Angelina Ballerina's Chipping Cheddar. Now Postman Pat has a special delivery service which takes him to Pencaster, and he has the use of a Jeep and even a helicopter. Angelina Ballerina has moved to the larger, more urban Camembert Academy. Even Fireman Sam's village, Pontpandy, has changed to a new location. Tragedies all. The beauty of village life is, in part at least, its lack of high drama (although there is some, I grant you!) and the ensuing pleasure in small things. In an average week I leave our village maybe once, for the supermarket. But this means that going to the library, the post office shop, and gasp, the pub, become major anticipatory events. The beach café has a new ice-cream flavour, stop press! The post office shop has extended its hours, amazing! And sitting down in the pub with friends on a Friday night, to share a bottle of wine? It's not fancy. It's not exciting. But it is gives me a deep pleasure. I'm glad to see that Peppa Pig still retains its focus on small adventures rather than high octane action. (Was Postman Pat, I ask you, ever meant to be exciting? I think not.) My toddler has become riveted by Peppa Pig lately, and even my older children stop and watch when it is on the TV. Peppa's trip to Italy with the missing teddy and the carabinieri who deliver it to her house is, while obviously unrealistic, also sweetly charming. And perhaps not as unrealistic as all that. In the first year we moved here, I lost forty pounds (or about $60) on the high street. I foolishly put it in my back pocket, went to pick up the children from school, and when I came back it was gone. The next morning the Head Teacher at the primary school asked at assembly if anyone had lost any money. My son promptly put up his hand. 'My mother did,' he said, upon which he was asked the amount. 'Forty pounds,' was the prompt reply, and with that confirmed the school secretary called to inform me they'd found my forty pounds. That morning a parent had seen forty pounds lying on the lane up to the school (where it had languished for a good eighteen hours), picked it up, and brought it to the school office. And from there it was restored to me. So forget CGI and all the gadgetry that Postman Pat and Bob the Builder have been given. Bring back the old days of stop-motion animation, charming villages, and their residents' tiny yet fascinating problems. That's what I want to watch. It's what I live. Wow! Bob is a grown up now, that’s fantastic. In our times, thankfully these shows were never available in native language also but it is very much possible in today’s time. Just like Andy Yeatman shows on Netflix have an option to change audio language. This way it becomes easy for kids to understand and get entertained.